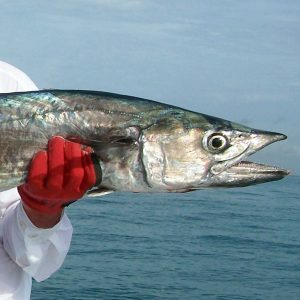 King mackerel are found both nearshore and offshore areas of our Atlantic coastal region. Kingfish are pelagic and schooling species fish migrating from south Florida waters in winter northward in spring and summer. They spawn offshore in mid-summer. Kings primarily feed on small fish and squid and take both natural and artificial baits. Live baits include pogies, herring, Spanish sardine, ballyhoo, and mullet. Lures should be flashy sub-surface lures or large fish-like plugs. Use 20-pound line and tackle, or heavier for larger kings, with a wire or mono leader. During the summer our kingfish move in close to the beach following bait schools and are great fun on light tackle. The preferred method of catching them is to slow troll live bait and are often referred to as smoker king due to their first high speed drag burning run. Anglers should use a light drag to avoid getting cut off.